I like some DIY action when I host parties, like the blini table I had one year, and the crostinis with different spreads in jars in December. Not surprisingly, my friends loved the smoked salmon spread (this is like the essence of Scandinavia, Hanna – oh yes! ), whereas I prefer the deeper, more complex flavours of the chicken liver mousse. But when my friends had overcome the hurdle of the brown dull colour and tasted it, they also really enjoyed it! Remove all tendons and chop the liver coarsely. Fry the onion until soft in butter and oil on medium heat. Add the garlic and rosemary, making sure the garlic does not burn. Add the wine and let some of it evaporate. Add the anchovies and let them melt. Turn up the heat and add the liver and fry until cooked through. Add the stock and let some evaporate but still keeping a good amount of liquid in the pan. Mix until smooth in a food processor. Add the cream little by little until desired consistency. Push through a fine sieve. Leave to cool and refrigerate. 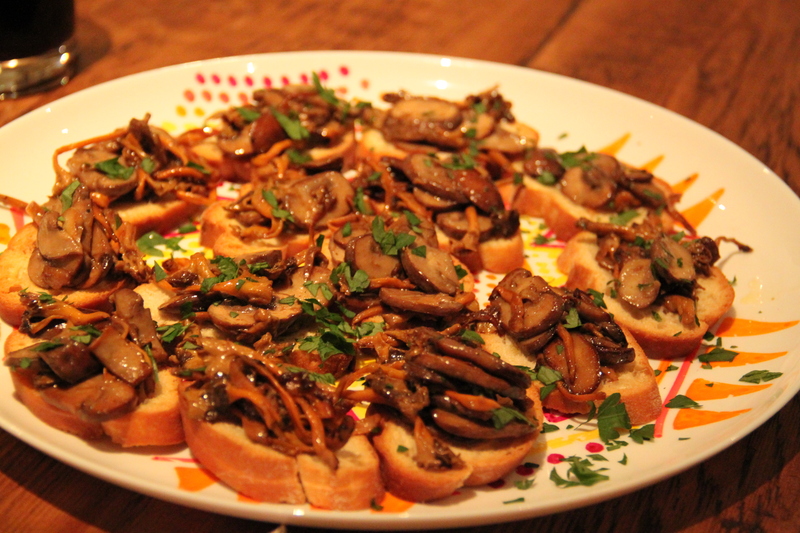 Twice in December I made these truffled mushroom crostinis for my friends. Above with chantarelles and chestnut mushrooms and below with only chestnut mushrooms as I was feeding lots of people and fresh chantarelles aren’t exactly cheap. What’s great about the recipe is that it can feed anyone. It’s vegan and works for people sensitive to dairy, and if you make glutenfree crostinis this works for coeliacs as well. When using the chantarelle mushrooms I added a bit of cream for added creaminess, so feel free to do that if you like, but plenty of oil (or use butter) is enough moisture for me. Slice the baguette, place the slices on a baking tray and drizzle with olive oil. Bake in 180C oven until golden brown and crisp, about 10 minutes. Leave to cool. Slice the mushrooms. Fry until golden in oil on medium heat (preferably in batches). Add the garlic and fry for another minute or so. Add the truffle paste, salt and pepper. 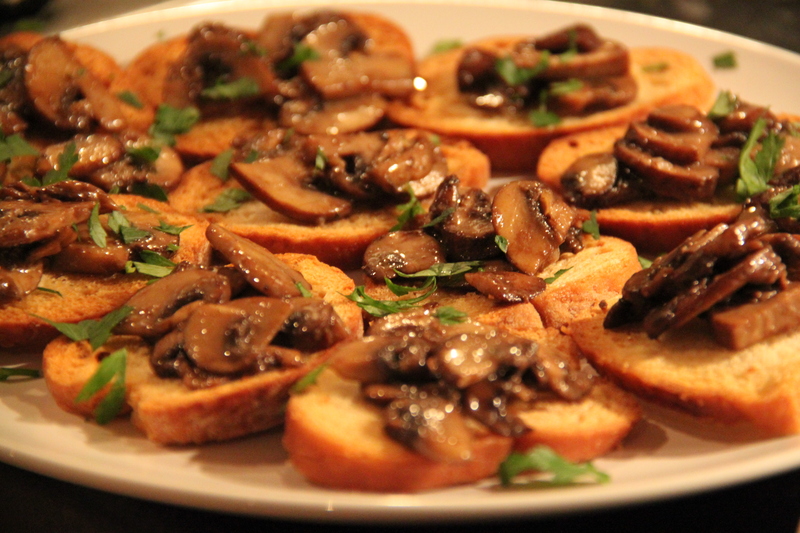 Divide between the crostini and topped with chopped parsley. And sorry for the silence over the holidays, I was busy cooking and hanging out with friends and family and having a well-earned break. I have a lot to share with you, and I thought we’d start with some glamour and New Year’s Eve celebrations. My friends Emma and Claes hosted a lovely dinner, I cooked and they took care of everything else. It was nice to share the responsibility and to be able to focus on only one thing. A great team effort! When the guests arrived we started off with champagen (Palmer & Co Brut) and this lovely canapé – chives pannacotta with vodka on a bread base, decorated with salmon caviar and dill. Incredibly Scandi and absolutely delicious! As we had a few non-meat eaters among us I used vege gel as a setting agent, but it is even easier to use gelatin leaves. (2 leaf gelatine to 1 bag vege gel). Translated and adapted from Pytte’s Swedish recipe. Mix the bread into crumbs in a food processor. Melt the butter and mix with the crumbs. Line a 20 cm by 25 cm dish with cling film and add the crumbs. Press them onto the bottom of the dish. Let it set in the fridge. Mix the cold cream with the vege gel and heat up in a saucepan while stirring. The mix will thicken so stir continuously for a few minutes. Let it cool a little and mix in the soured cream. If the mixture curdles, push it through a sieve. Chop the chives and add to the mixture. Add the vodka and seasoning. Pour the cream mixture onto the bread base and leave in the fridge to set for a few hours. Before serving either cut into small squares or cut out rounds with a small cutter. Decorate each canapé with a dollop of caviar and some dill. If you want to make quick canapés, I know the perfect shortcut. 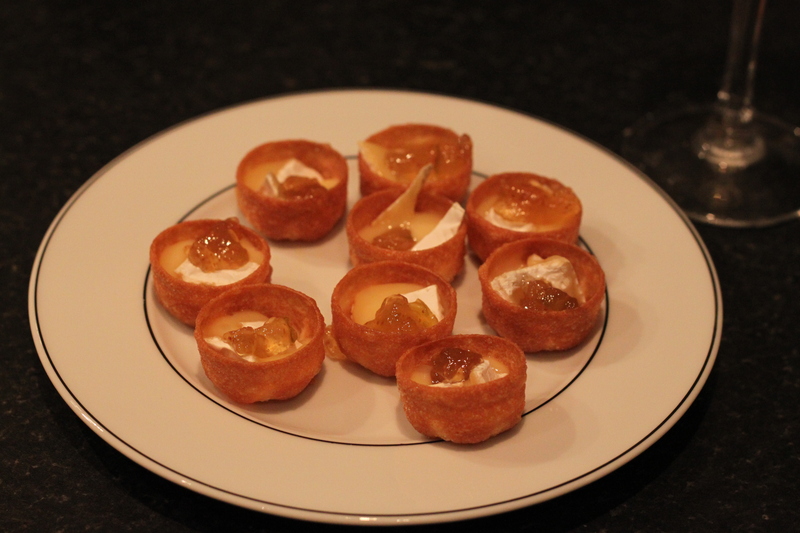 These crustades you can get in Waitrose (by the crackers) and fill them with anything you want to create a gorgeous canapé. Only thing you need to think about is that if the filling is at all moist, you should fill them just before serving. I filled these crustades with some ripe brie, but the tray in the oven and baked them for a few minutes, until the cheese has melted. Add a little green fig preserve and you have a delicious canapé. Perfect to munch on while preparring supper. Trim the cheese of the crust. Cut into small cubes. Place one cheese cube in each crustade. Place in 200C oven for 3-5 minutes or until the cheese has melted. Remove from oven and top with 1/2 tsp fig preserve. Serve immediately. The second day in Southern Sweden we spent the day in Falsterbo, a lovely little town by the seaside because Christopher was playing golf with Claes there all day, at a links course with insane amounts of water but nice views. I don’t play golf, so I spent the day with my best friend Emma (Claes’s fiancée). We gossiped a lot, had lunch at a nice café and prepared dinner for the boys. When they got back feeling tired after a day outside, we bribed them with beer to light the barbecue, while we took care of the rest of the cooking. When we went to the supermarket I was pleased to see that they had lots of fresh girolles, that are in season now. It is my favourite mushroom and I find it really sad that I can’t buy them in a normal supermarket here in the UK. 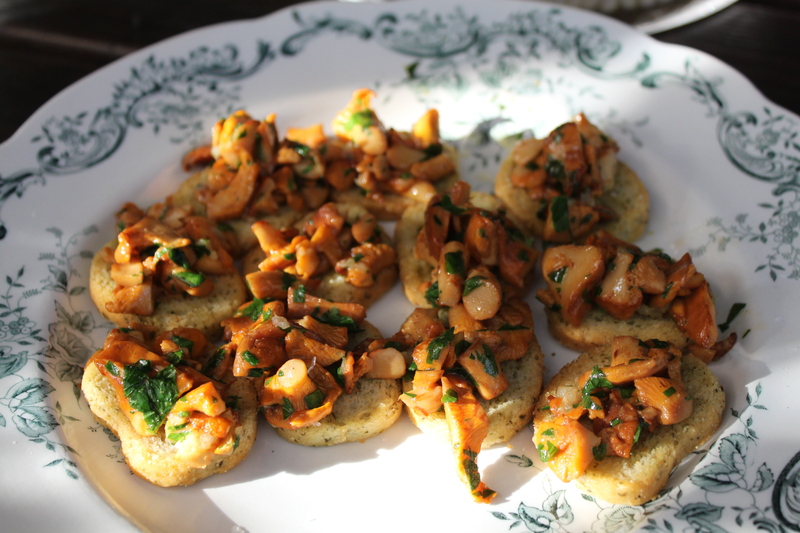 Girolles are best paired with butter and garlic and they make out a simple, but delicious, canapé. 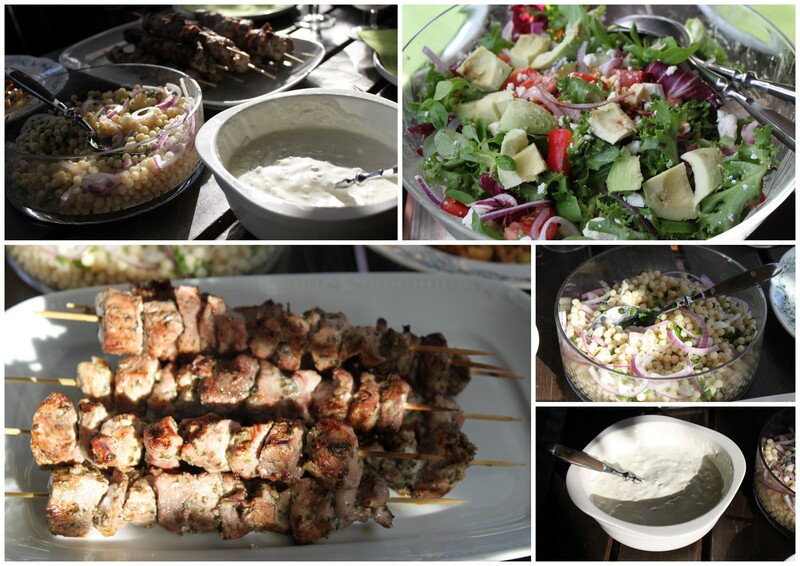 We also had souvlaki, a nice salad with cucumber, tomatoes, leafy mixed salad, red onions and plenty of feta and another salad with giant couscous, pitta and homemade tzatsiki. 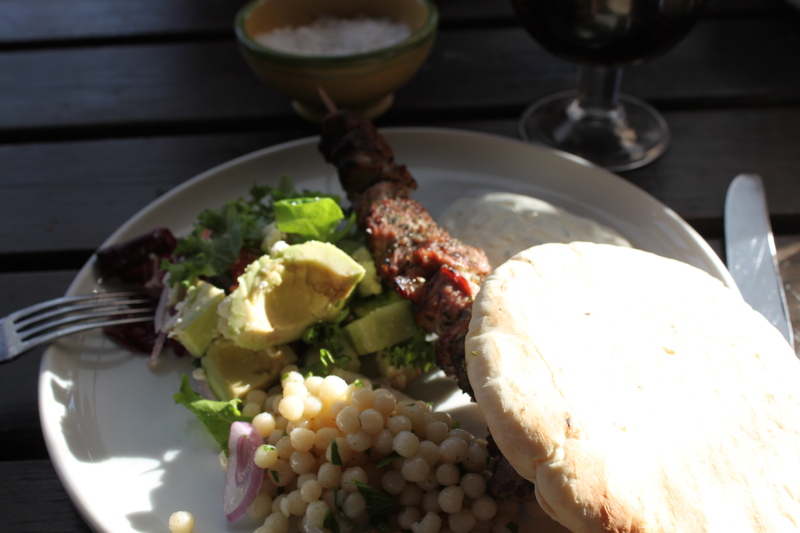 I prefer giant couscous to the smaller variety, it is chewier and tastes better I think. In the salad above I kept it really simple, adding just thin slivers of red onion, herb salt, olive oil and chopped parsley. Simple yet delicious. Fry the girolles on high heat in some of the butter. Add more butter as well as the garlic and lower the heat (so the garlic won’t burn). Season and mix in the parsley. Scoop up onto the biscuits and serve.